Heat oven to 375°F. Make and bake cookies as directed on pouch. Cool completely, at least 30 minutes. In food processor, process half of the cookies to coarse crumbs. Remove to medium bowl. Continue to process second half of remaining cookies to coarse crumbs; add to bowl. Stir in melted butter until well blended. In ungreased 13x9-inch pan, press cookie crumb mixture firmly in bottom. Set aside. In medium bowl, beat cream cheese, peanut butter and icing sugar with electric mixer on medium speed until well blended, scraping down sides of bowl frequently. Beat in 2 cups of the whipped topping. Spread over cookie crust. In another medium bowl, beat dry pudding mix and milk with whisk about 2 minutes or until thick. Spread over cream cheese mixture. Spread remaining whipped topping over top of pudding layer. Cover and refrigerate 4 hours. 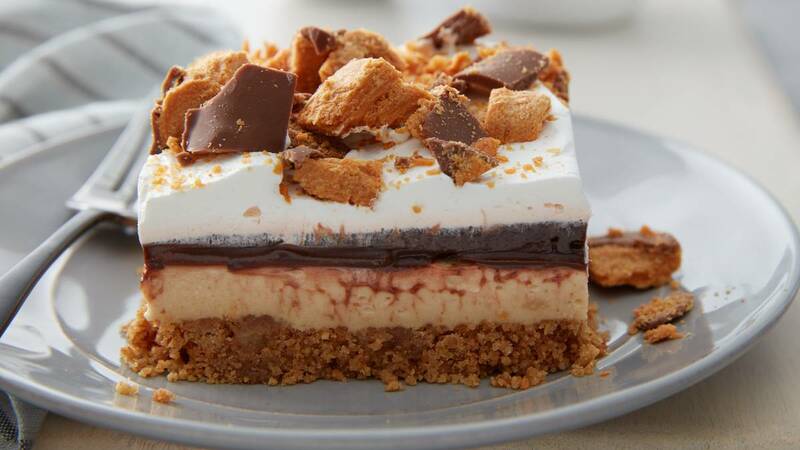 When ready to serve, sprinkle chopped candy bars on top. Cut into 6 rows by 4 rows. Cover and refrigerate any remaining dessert. To quickly soften cream cheese, remove from wrapper, and place on microwave plate; microwave uncovered on High about 15 seconds or just until softened.